History Undressed: History Undressed is Excessively Diverting! I was pleasantly surprised and honored today to recieve a nomination for Jane Austen Today's Excessively Diverting blog award from my dear friend, Mozart - and believe me, this musical genius has a very entertaining blog himself - Prima La Musica! 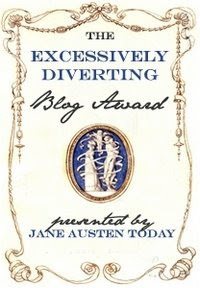 "The aim of the Excessively Diverting Blog Award is to acknowledge writing excellence in the spirit of Jane Austen’s genius in amusing and delighting readers with her irony, humor, wit, and talent for keen observation. Recipients will uphold the highest standards in the art of the sparkling banter, witty repartee, and gentle reprove. This award was created by the blogging team of Jane Austen Today to acknowledge superior writing over the Internet and promote Jane Austen’s brilliance." The Rules: Recipients, please claim your award by copying the HTML code of the Excessively Diverting Blog Award badge, posting it on your blog, listing the name of the person who nominated you, and linking to their blog. Then nominate seven (7) other blogs that you feel meet or exceed the standards set forth. Nominees may place the Excessively Diverting badge in their side bar and enjoy the appreciation of their fellow blogger for recognition of their talent. Congratulations! And so well deserved. I love visiting this blog, and Mozart's as well. What a pleasant surprise, I am honored, thank you! Congrats!! That is well deserved, Eliza! Oh Thank you so much for sharing this with my blog!! I am soo honored bc I <3 your blog! How fabulous! Thank you Eliza! You can conquer the world if you want in your own style!Order your Bespoke Suits and Shirts online! !